SWIFT™ is an add on for printing presses to save foil, register holograms and apply patches. The system is designed to be movable to any printing station on the rail of narrow web printing presses. ✓ A very high stepping frequency by vacuum buffers moves the foil up to 20 times per second, allowing a resulting web speed of 120 m/min. Even with short labels repeat length, high printing speeds can be achieved, where traditional mechanical savers cannot save anymore. ✓ SWIFT™ is very robust and processes all types of foils: standard hot foils, holographic foil, magnetic strips, etc. SWIFT™ fits with press manufacturers hot foiling stations. New tools are not required. Retrofits are very cost effective. 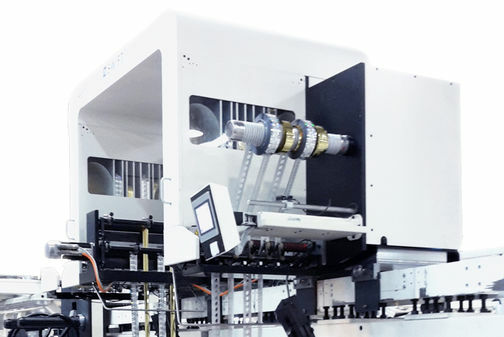 Where no stamping system is installed yet, Pantec may deliver it’s foil stamping units ELECTROMAN™ or FLOWMAN™.